"After years of trying different products to help me with a disturbed sleeping pattern I have finally found my solution! I’d recommend this to anyone who is having any trouble sleeping." Stress and anxiety can often interfere with sleep. This download offers an easy way to control your sleep patterns. Benjamin Bonetti is one of the world's bestselling hypnotherapists. His advanced hypnotic technique sends positive messages to your subconscious so you can accomplish your goals. Powerful affirmations and visualisations encourage change to happen naturally. Through hypnosis, learn to relax and clear your mind to prepare for deep, refreshing rest. Allow everyday worries to disappear, and rediscover just how good sleep can feel. Now Includes: How To Beat Insomnia With Hypnosis Audio and a complimentary PDF Chapter of Benjamin’s 2013 Bestselling Book How To Change Your Life. He utilises hypnosis and Neuro-linguistic Programming to change thinking patterns and inspires others to take massive action, through a number of tools designed to change the mind-set. Recommended Weight Loss Audio for 2014 by the Metro Magazine. 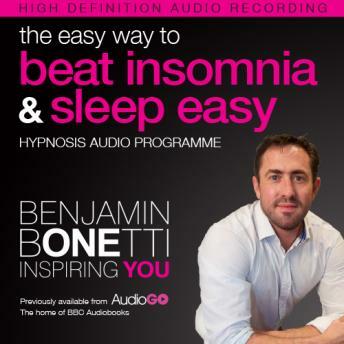 In 2012 Benjamin became the leading BBC Self-Help Audiobooks author with a new advanced range of hypnosis audios reaching the Top Ten Charts within just a few weeks after release. The Easy Way range includes the titles; Weight Loss, Original Gastric Band, Confidence, Self Esteem and 7 other titles. 23rd Bestselling Non-Fiction Book WH-Smith Christmas, New Year 2013/14 Ex Military - Benjamin has appeared in a number of magazines, radio and TV features as the “Celebrity Secret Weapon”, including; The Sun, BBC Radio, Metro Magazine, The Irish Times, Friday Magazine, Bookish, HR Grapevine, Diets In Shape, Slim At Home, Decision Business Magazine, The Gulf News, The Best You, Celebrity Wife Swap, Latest 7 Magazine and is the “preferred” A-List Coach for International Celebrities. Awesome audiobook and helpful to my daughter during a terrible night of nightmares.